Bayonne to Maine to Canada Cruise! Adventure of the Seas is the last in the Voyager class series of ships that we hadn't sailed on... and I've never been to Maine... so when we saw that Adventure was cruising out of Cape Liberty, Bayonne, NJ, it was an easy choice to do this cruise since the embarkation port is a mere 90 minute drive north of us. 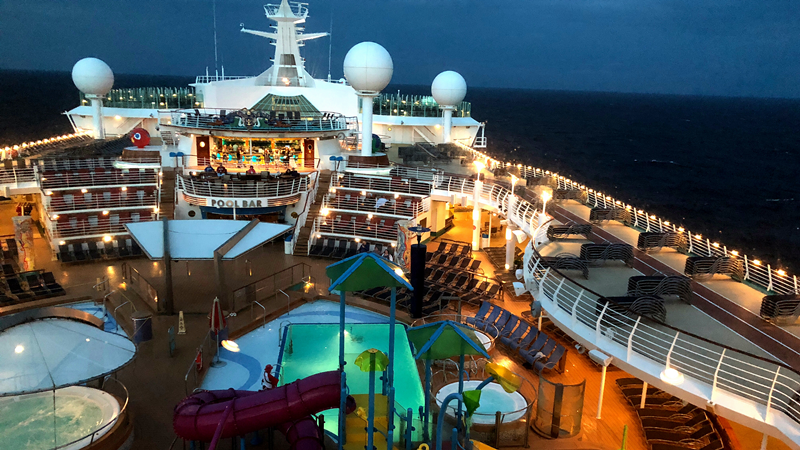 (Anytime you can cruise without having to fly to the departure port is a huge savings, and so much less travel stress) This cruise would also be our second visit to the Canadian ports of Saint John, NB and Halifax, NS, so we were very excited about this as well! (See: http://pndcruisereviews.com/cruise/Voyager%2004/Voyager04.htm for that cruise review.) 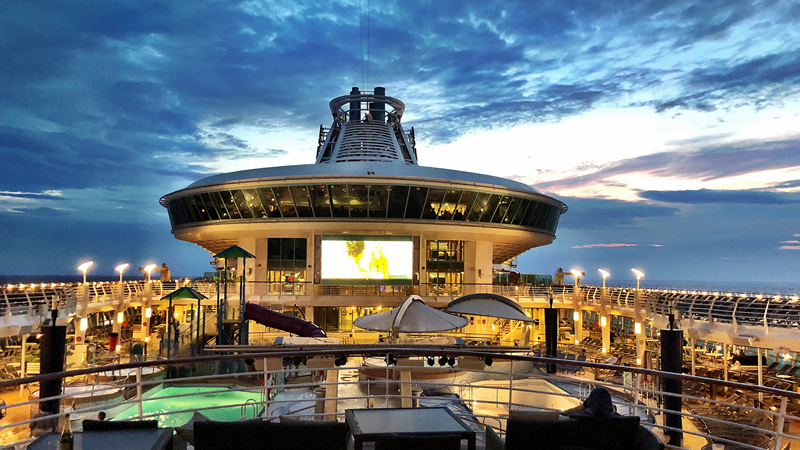 Adventure of the Seas had undergone some recent upgrades such as the Flow Rider and the giant waterslides aft and the children's waterpark at the Main Pool area and Izumi and Chops Grille. But she still had some very worn and rough spots that really needed some TLC. We saw stained pool decks and stained carpets and furniture in many places and also some rust here and there as well as some plumbing that needed to be replaced. But overall the ship was well maintained. The crew and staff aboard was Adventure's main claim to fame. They were all 10 out of 10... not a miserable person among them. All were happy and eager to please and they more often than not went above and beyond the typical service you see on cruise ships. Sadly, Royal Caribbean's Windjammer buffet continues it's spiral downward in food quality. As we found on Allure and Explorer, food in the Windjammer is bland at best, and generally bad. This is something Royal Caribbean truly needs to address. Just because a company wants to cut costs at their buffet, it doesn't mean the food has to be bad. More on Windjammer below. Embarkation Day: Much has changed at Cape Liberty since our last sailing out of there aboard the Explorer of the Seas in 2014 (See: http://pndcruisereviews.com/cruise/Explorer%2014/Explorer14.htm). The port is now an extremely easy and professional port (finally) to use. The approach to Cape Liberty is even much better than it used to be. You go down the same road past the old brick buildings and finally swing around to the left into a place to easily drop off your luggage (no more backing into a line of traffic) then proceed to the parking building. Parking at the building is $20/day and includes all taxes and fees in that price. There are helpful porters at the luggage drop off and at the parking building there are many guides to help you get where you need to be. You pick up a ticket going into the building and you take that with you as you need to pay after the cruise at one of the kiosks at the building (again, there are attendants there to assist you) before going in and getting your car. Once parked, you proceed to the terminal building for check-in. We had our Seapass paperwork ready to go and we already had uploaded our photos for the ID (it was cool to see pictures we took pop up getting on and off the ship all week) so we got on pretty quickly. I'd say from dropping off the luggage to parking the car to boarding was about 20 minutes. The Cabin Experience: Our experience here was almost exactly the same as that on our Explorer 2014 cruise, so I will repeat some of what I said there. We took an inside cabin, #9283. Inside cabins, while comfortable, are small spaces. As we found on Explorer, in this inside cabin there was very little space between the bed and the wall... maybe about a foot on each side of the bed. This was okay except that there was also a blue loveseat on the wall that made access to the bed on the left side impossible. Being the tried and true "make it work" cruisers that we are, we simply moved the loveseat 90 degrees so it faced the bed and opened up the space considerably. Access to the right side of the bed was blocked by the makeup table/tv hutch, so I took that side and got into bed from the bottom while Diane had the easy access from the left side. The loveseat jutted out slightly in the pathway to the bathroom and cabin door, but it wasn't a problem. There was no mini table to get in the way this time (yay!) We explained to our cabin steward, Cristin, that we moved the loveseat because we wanted it this way and he left it alone. Otherwise, this proved to be a comfortable cabin. There was plenty of closet space, a safe, and a make up table for Diane and a TV and minibar fridge. (Note, yes... our 29" and 26" and two carry-on suitcases fit nicely under the bed!) The fridge is no longer stocked with items unless requested. The bathroom is the typical "you can do everything at once" sort of space. There is good storage in the bathroom mirror cabinet. Don't expect decent soap or shampoo... the soap even newly unwrapped, was more like an unscented piece of plastic. And the shampoo was some sort of clear stuff that dried your skin out. So, bring your own soap and shampoo products aboard with you. (Note, your experience might be better in a suite with bathroom products.) The towels and wash clothes were soft and smelled fresh. The drain and faucet drain were old and rather disgusting. They needed to be replaced. Inside Cabin #9283- Note the tiny space between the wall and the bed! Adventure of the Seas Pools and Spa: I only used the spa facilities once and that was a brief visit. Since my back injury last year, I avoid lifting anything heavy as much as possible. The Main Pool consisted of two pools, four hot tubs and a newly installed mini waterpark for kids. The adults only Solarium (our favorite spot) had a single pool and two hot tubs. On our cruise, which featured temps mostly in the high 60s to mid 70s, many deck chairs were available except in the Solarium. One surprise for us was lifeguards (a first!) at all the pools. Apparently some accidents have pushed RC to have lifeguards at the pools now. They diligently focus on the pool like statues even when the pools are empty. All of the pool areas are well maintained. There's also a large screen TV at the main pool area that played the NFL Thursday night football season opener (Eagles vs. Falcons... Eagles won! Go Birds!)... many complained that Adventure neglected to have a bar open at the pool during this game. (Loss of revenue, RC!) There is free self serve soft ice cream on the pool deck during certain hours of the day. RC still forces you to sign in and out any towels you need for the pools. This is so ridiculous (and you really need to be a major creep to want to steel these tattered towels)... their sister company, Celebrity, doesn't put you through this at all. Solarium Pool with ever vigilant lifeguard! Adventure of the Seas New Stuff: Adventure was upgraded with a Chops Grill steakhouse, Izumi sushi restaurant and the aforementioned waterpark for kids, plus a massive twin waterslide aft and the Flowrider surfing simulator. I did both of the water slides (the yellow tube is the fastest). I did have some concern that this would bother my back, but not at all. What adults do get is some incredible speed, so be prepared for a nose full and earful of water when you hit the bottom! Excellent ride! Kids love these waterslides as well, and I swear that it seemed as though some boys just lived there. The Flowrider had some body surfers (on boards, that is) this trip and I considered trying it until I saw one man nearly lose his trunks. I decided I'd rather not have that happen to me so I avoided the Flowrider. There's also a rock wall on the Adventure. 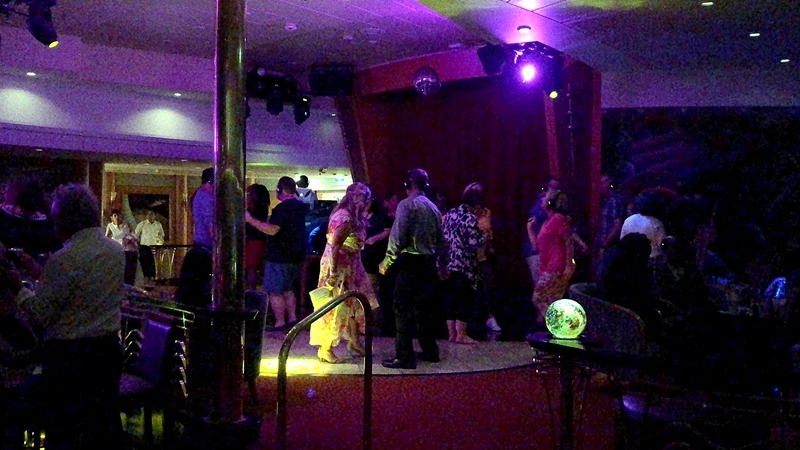 Chops Grill is housed in what would have originally been the disco on the ship. Adventure Bars and Nightlife: Adventure has many bars including the fleet staples, Bolero's, Schooner Bar, Viking Crown Lounge and all the rest. They all have great (but somewhat expensive) drinks and are staffed by very friendly bartenders. The Viking Crown Lounge (deck 14) at the top of the ship is now the premiere nightclub and the Silent Disco night there is not to be missed! Silent Disco at the Viking Crown Lounge... everyone is listening to one of two different audio feeds and dancing to their own beat! FUN! Promenade and the Duck & Dog Bar! Excellent pitstop! Beautiful Night Club at Viking Crown on Deck 14... windows overlook the ship! Excellent bartenders all over Adventure... this one was getting ready to close but stopped and made drinks for Steve and I anyway! Adventure Dining Experience: With the exception of the Windjammer, all of the restaurants we ate in aboard during this cruise featured very good food. Windjammer Buffet: On embarkation day, as usual with RC cruises, we were herded up to the Windjammer buffet on Deck 11, and once again, it was a zoo of people sitting around that had already finished eating and they were not budging from their tables because they didn't know where to go. Really, RC should stipulate that you must move on once you are finished eating, especially on that first day. It's not fair to others to hog chairs in the buffet area. On a ship as large as Adventure, there's a lot of places to explore before your cabin is ready. We got into the buffet a little past 11am and there wasn't a single table to be had for the lunch serving. So, being savvy cruise travelers, we took our plates and headed to the (still) empty tables out by the pool near the ice cream station. Those tables filled up within minutes and there was a long line to get into the Windjammer when we went back. As I stated in previous cruise reviews, the Windjammer food is continuing to nosedive in quality. If you must eat there, do it on the first day... our first meal there was acceptable, but the few times we went there after (usually because the Main Dining Room only served lunch on Sea days) were pretty awful. I know RC is looking for ways to cut costs, but as I stated above, this doesn't mean the food has to taste bland or bad. Many local buffets on land do a superb job with otherwise cheap ingredients. It often feels like they are hoping people won't go to the Windjammer. It's a mystery to me, and it has begun to sour us on choosing RC unless (like with this cruise) it was the only option available for the itinerary. Staff in the Windjammer were very polite and accommodating. My rating for the Windjammer would be 1.5 stars out of five. Eat breakfast and lunch at the Main Dining Room whenever you can. Our table for four, Table 550, which we shared with Kim and Steve! Choose your ingredients and have a Chef build your salad for you... Main Dining Room for lunch! Giovanni's Table: On the Adventure, Giovanni's is located right next to the Windjammer and it's a gorgeous spot. As a specialty restaurant, there is a cover charge. Some might find it pricey, but we did a BOGO for two specialty restaurants that we signed up for before the cruise. (Note, the BOGO deal requires that you eat in specialty restaurants on your first two nights of the cruise. We weren't aware of this, but they took care of our needs) The filet mignon was impeccable here (some said better than the filet mignon at Chops!). I didn't care for the octopus appetizer I ordered, but then I never actually ate octopus before. It sort of had a thick texture... not the calamari like texture I imagined it would have. At any rate, the service was amazing (one server even said she recognized us from cruising on the Explorer- wow!) here and the ambiance was wonderful. I think this was my favorite meal of the entire trip. If you are only going to choose one specialty restaurant, make it Giovanni's Table. I'd give it 5 stars out of 5. Chops Grille: We always have a great meal at any RC ship's Chops Grille and this was no exception. My only complaint would be that the place was amazingly busy on our night and for that reason, service suffered from it's usual over the top levels. The Maîtres'd even stopped by and apologized. But the steak made me forget everything else. Chops is a specialty restaurant with a cover charge, and we ate here for our second BOGO. Diane and I got the 16oz ribeyes and they were magnificent! They serve huge sides as well. The shrimp cocktail was great (the largest shrimp aboard). I'd give them a solid 4.5 out of 5 stars. Definitely worth the price... especially if you sign up for one of the pre-cruise deals. Johnny Rockets: I always love the atmosphere of JR's, but the burgers never do much for me. But I always make a point on any RC ship to stop at JR's for a delicious malted shake... and onion rings and french fries! We stopped here for a late afternoon snack before playing miniature golf one day. This low fee restaurant always has a great crew, and our waiter here was no exception! Worth a stop! Milkshakes, onion rings and fries at Johnny Rockets on the Adventure of the Seas! Our Itinerary: We were very excited about this cruise itinerary as it was our first with ports in Maine! I'd never been to Maine, but Diane had been a few times as a teenager. We also looked forward to visiting lovely Canada once again... a beautiful country with very nice people. 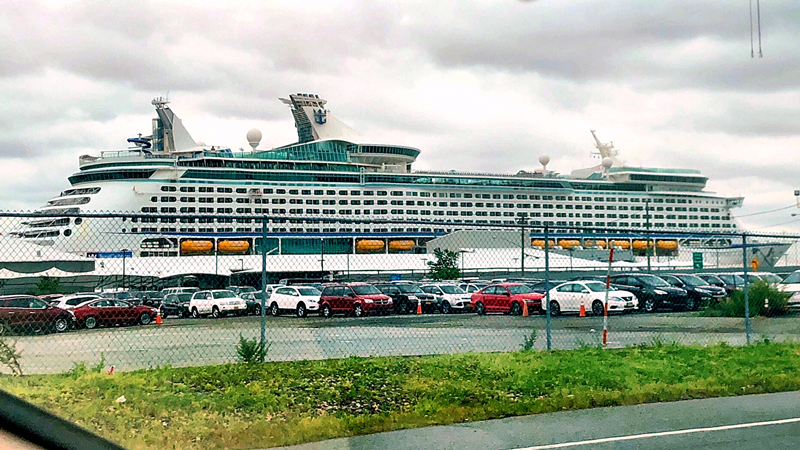 We did Royal Caribbean excursions at all but Halifax where we discovered our own fun walking from the port terminal building and out to the right over the excellent waterfront boardwalk with its shops and restaurants! The excursions, with one exception, were all wonderful! Portland, Maine (Sept 2, 2018): This was a fun day from the start. We took the RC excursion "Best of Portland and Kennebunkport" and our tour guide was Linda who was a former school teacher, so she had an excellent delivery of all the facts we needed to know about Portland. We stopped at the Portland "Headlight" (Lighthouse) which was really cool. We proceeded along the coast through a beautiful beach front and then on to Kennebunkport where we had about 90 minutes to hangout. Diane and I grabbed our first (ever) lobster rolls (think of fresh Maine lobster with some mayo on an open bun with some lettuce) at Federal Jack's restaurant... it was an excellent meal and our location was on the outside second floor terrace overlooking the water! After lunch our bus tour continued through Kennebunkport and we saw the land jutting out into the sea where the Bush family built their "compound", and then we returned back to Portland. After the excursion, Diane and I walked about town. I was on a mission to find one of the Whoopee Pies that Linda said were better than those made in the Lancaster, PA area. I found them at the bakery called "Two Fat Cats" and they were delicious! (This bakery was very busy... it's sort of tucked back off the road a little) And yes, they were BETTER than those I've had from Lancaster! Bar Harbor, Maine (Sept 3, 2018): This was the big surprise for us... Bar Harbor is fantastic! It was our favorite stop on the whole cruise. So many little shops and restaurants that seem to go on and on. We got off the ship (via tender) by 11am as we had an afternoon excursion and we wanted to get some lunch in town. So glad we did as it was so much fun. On top of all this, the surrounding natural beauty is breath taking. We stopped at Geddy's (we were attracted by the lobster claws jutting out of the front of the restaurant) for more lobster rolls (again, delicious!) and then we walked all over the place until it was time for our tour. Our tour was the RC excursion called "An Intimate Look at Acadia National Park and Cadillac Mountain" This was conducted by a very knowledgeable man in a 14 passenger bus with large windows. He took us through Bar Harbor and described the homes (while driving) and then drove us to a Acadia National Park where he took us to an awesome beach with amazing views. From there it was all the way to the summit of Cadillac Mountain where we had unbelievable views of the bay and the distant Adventure of the Seas. This tour is also highly recommended... I'd do it again. A unique thing happened for us as the Adventure departed Bar Harbor... thick banks of fog rolled in and we literally couldn't see the water from our cruise ship's outside decks! This was a first! To add to the event, it was night. We loved it, even though it was a little scary as well. The Captain kept the ship's fog horn blowing at intervals throughout the night. It was barely audible from inside the ship. Just a small sampling of the stores and restaurants at Bar Harbor! Zoomed in look at Adventure with Bar Harbor to the lower right from Cadillac Mountain summit! Fogged in as we leave Bar Harbor, ME! Saint John, NB, Canada (Sept 4, 2018): Since we had been to Saint John back in 2004 and we did the Bay of Fundy and Titanic museum tour, we wanted to do something very different this time. So we signed up for the RC excursion called "St Andrews by the Sea". St. Andrews is a 60 minute ride by bus south of Saint John and as such, you are practically back in the USA. In fact, we could look across a body of water there at Maine. This tour was a disaster on many levels, and I definitely do not recommend taking it. It started out pretty well with an amiable guide who seemed to know his stuff. There was a stop at a park at the water's edge looking across at Maine. Then we drove into St. Andrews proper, and we stopped near a nice white church. We were told we had about an hour and a half to hang out and walk around St. Andrews. After walking a few blocks to where the shops were, we were dismayed to find that many were closed (at noon on a Tuesday?). There really wasn't much to do. So we decided to grab a quick lunch at the Olde Tyme Pizza and we sat out back on a deck with a narrow view towards the water and made the best of it. I was already regretting that we didn't just explore Saint John instead as our stop at this port was a very short day with departure set for 2:30p. We got back to the bus and after the guide and driver did their head count, we were on our way back to Saint John with a 60 minute drive back to the port. (Adventure was scheduled to leave about 30 minutes after we would get back... so time was of the essence) About 30 minutes into that return trip, as our guide was telling us some interesting stuff about the Canadian government and their healthcare system, a young woman spoke up and asked if anyone saw the lady that had been sitting near her. Everything came, more or less to a stop as the guide went into a panic and started making calls back to St. Andrews and to his boss... and people on the bus started talking in a fevered pitch (panic in their voices - I started laughing, of course at some of the ridiculous things they were saying) and finally it was decided that we should turn back and get the missing passenger even though no one could confirm she was there. (I'm glad we did, but I kept thinking there had to be a better way to handle this) Once we got there, she was waiting (looking understandably ruffled) and everyone applauded her being retrieved. We got back on our way again (and since this was an RC excursion, there was no fear that the ship would leave without us) but the guide (perhaps thinking about the lecture he'd get from his boss for leaving a passenger behind?) never could get back into the groove of his oral presentation about Canada. In fact, his talk went into a rather personal talk (at times mildly inappropriate) about his own personal battles with cancer and the importance of cancer screening. Suddenly a woman stood up and dramatically insisted that he stop talking about his battles with cancer (maybe she had been dealing with her own problems) and another shouted out that he should get back on track about Canadian history. After pondering this for a few minutes, the guide went on a rapid fire history rant about Canada that was difficult to follow. I lost interest and I couldn't wait to get back to the Adventure of the Seas and put this whole day behind me. We had an excellent bagpipe send off at the pier. Next time, we will hang around Saint John instead! St. Andrew, View from back deck at Olde Tyme Pizza... great food! Halifax, NS, Canada (Sept 5, 2018): This was an excellent stop as we decided to discover Halifax on our own this time. We got off the Adventure and leaving the terminal building we made a right and kept walking along the path leading to the boardwalk along the waterfront (with a quick stop on the way at the Farmer's Market) and it's beautiful views, and restaurants and shops and historical stuff! It was a beautiful day so we walked basically the entire walk as outlined on the small walking map they gave us in the terminal building (where there were many vendors as well). I loved it here, and my only regret is that we didn't stop to eat in town. (Diane wanted to, but for some odd reason, I wanted to eat on Adventure and of course, all that was open was the Windjammer- blech!) Next time we are in Halifax, this is where we will be. Excellent time! The beautiful Halifax boardwalk... turn right when you leave the ship and just keep walking! Halifax waterfront walk... many shops and restaurants and street performers! Halifax waterfront walk... such a cool place to spend the day! Lighthouse view as we leave Halifax! Adventure of the Seas is a wonderful ship... she's gotten some upgrades as I mentioned above, and she still has some more upgrades that need to be done. Where Adventure soars is in her wonderful crew! (I can't state this enough!) They are about as polite and helpful as anyone could ask for... nothing needs improvement here. The number one thing that needs improving (and this is getting tiresome to repeat over and over) is the food quality and variety in the Windjammer buffet. It almost seems like the aim is to shoo people away from the buffet. If cutting costs is the reason for the pivot downward in food quality and variety in the Windjammer, then Royal Caribbean needs to find cooks who can be more creative with their budgets. Dessert on a buffet should never be tasteless (I picked three cakes one day, and all three were as bland as could be). Hamburgers shouldn't taste like they are nearly beefless (no, I wasn't eating a veggie burger... I doubt there was such a thing in the Windjammer). Where are the wraps of old? As for entertainment, the production shows (except for the ice show, which was one of the best!) are just plain dull. Do we really need another show that features a "Singing in the Rain" rendition? We actually walked out of the production show (we never do this) as we felt we were wasting our time. The singers and dancers were fine... the show was not. I'll leave on a positive note... I was so very happy to see bar servers walking about the pools (even the Solarium pool) taking drinks orders again! These had fallen off in recent years on Royal Caribbean (or at least there weren't enough to be very visible) and it was a real loss of revenue as people would get frustrated trying to squeeze in to the bar to place their own orders. Bravo for bringing back more poolside service! The best show aboard... Studio B's Ice Skating Show! I have some excellent videos shot during our Adventure of the Seas cruise on my Youtube page. Please subscribe to it if you like what you see there! https://www.youtube.com/channel/UCtmPfr0qksvgn4Aj1pIuG8w?view_as=subscriber I will be adding additional videos as time goes by, so stop back from time-to-time. Adventure... looking all the way up to those twin water slides!